How can I remove a job from a Queue? To remove a job from a Queue, locate the job in the Dispatch Board Job List, if you are not sure which filter to use, try All Jobs. 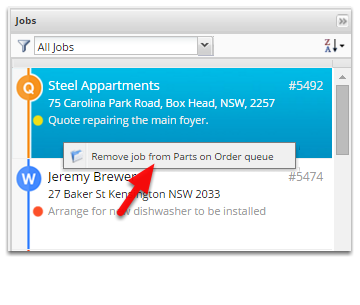 Right Click on the job and select the "Remove from queue" menu link. This will immediately remove the job from the queue. How do I delete/remove jobs in ServiceM8?